Some of you may already know this, but I've been pestering Vanja to provide artwork for RGCD for some time now. After seeing her amazing looking artwork on various unfinished C64 game previews, I have begged her time and time again to collaborate with someone and get something released. And you know what? With the help of coder Andreas Gustafsson, she finally has! 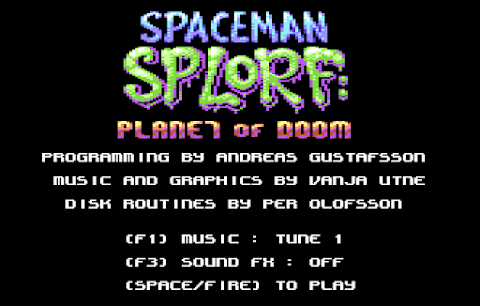 Enter stage left, Spaceman Splorf! In the first of several planned Splorf outings, Mermaid and Andreas have played it safe by opting for their first project to be a 'simple' one-button arcade score chaser. 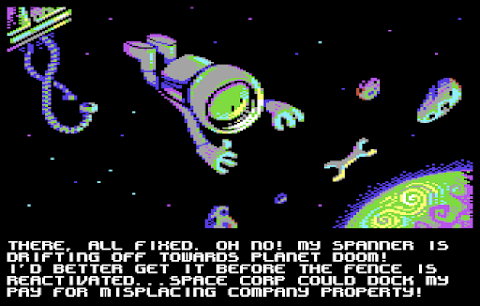 But to be fair, there's more depth to Spaceman Splorf: Planet of Doom than you might initially realise. Sure, it has amazing graphics (the introductory cut-scene is worth the download alone), but Vanja has really gone to town with the 8-song soundtrack too, with the introductory theme borrowing from Battlestar Galactica, Star Wars, Hitchhikers Guide to the Galaxy and even Dune! Oh, and it has twin-SID support too for extra dopeness. Add to the mix some of the cutest animations and game graphics I've yet to see on a C64 and a full highscore system, and really there's very little more you could ask for. It's up there with C64anabalt, in my opinion, as a classic 1-button game. Despite the casual style (fire to thrust upwards, avoid borders and meteors, survive as long as possible), I find myself regularly going back for one more game - and I've been lucky to have been playing it for weeks already. It's a keeper. 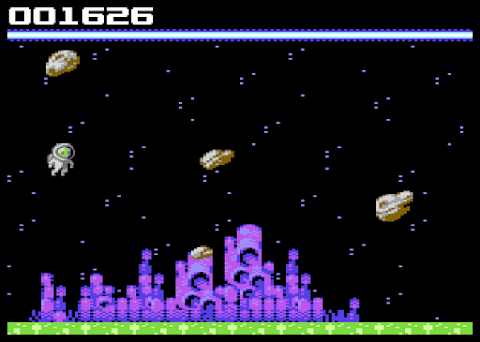 If Vanja and Andreas can maintain the momentum and complete their next two planned projects (a Spaceman Splorf shmup and adventure) with the same attention to detail that they have employed here, then they'll be way on their way to the top of the C64 gamedev scene. Shame it's not 16KB, because this could have been a serious contender in our competition. Grab your copy of Spaceman Splorf: Planet of Doom here (from the official website). Important Note for RGCD Cartridge Fans! Vanja and I have discussed the possibility of creating a nice Spaceman Splorf cartridge package (game cart, comic, postcards, A3 poster, DX case, 25mm button badge), and have worked out that we could do it for about ~£25 a piece (depending on quantity made). However, some additional work would be required for it to be 'GS' compatible, so before committing we'd like to have a rough idea of how many people would actually buy the game. So... it's over to you to decide whether or not this happens!